As we biked towards Rotterdam, we spent most of the ride surrounded by fields and small villages. Suddenly after crossing a bridge the city began to reveal itself seemingly out of thin air, evidence of the Netherlands strict spatial planning. 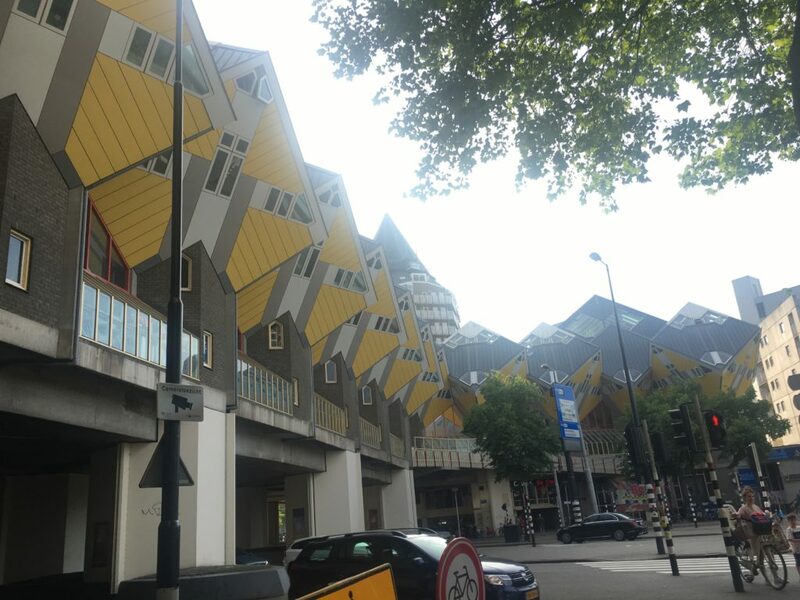 I had been noticing the creative modern architecture throughout our trip, but in Rotterdam I realized that it had been taken to another level. Inside the cube houses was even stranger! Windows were plentiful, but floor space was limited. In most of the cities we have visited, we were able to see historical buildings dating back hundreds of years. However, Rotterdam was almost completely leveled by German bombs in World War II during the Rotterdam Blitz of 1940. The buildings of Rotterdam were replaced in the coming decades by increasingly modern and innovative architecture, resulting in a truly unique city. 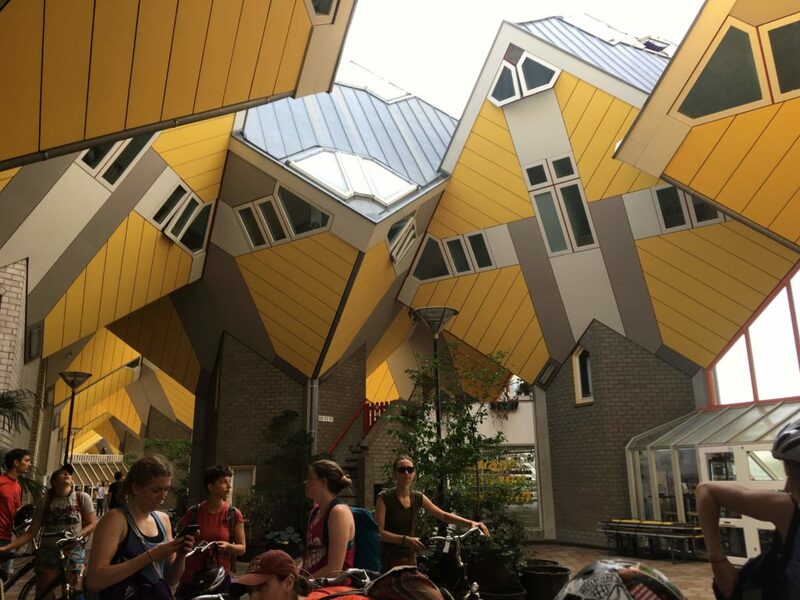 One of the funkiest buildings in Rotterdam happened to be the hostel we stayed in for the night. The eye catching yellow cubes that contained our rooms were tilted off-axis and perched on the second and third floors. As we got our room keys we looked forward to seeing what the cube rooms would look like from the inside. 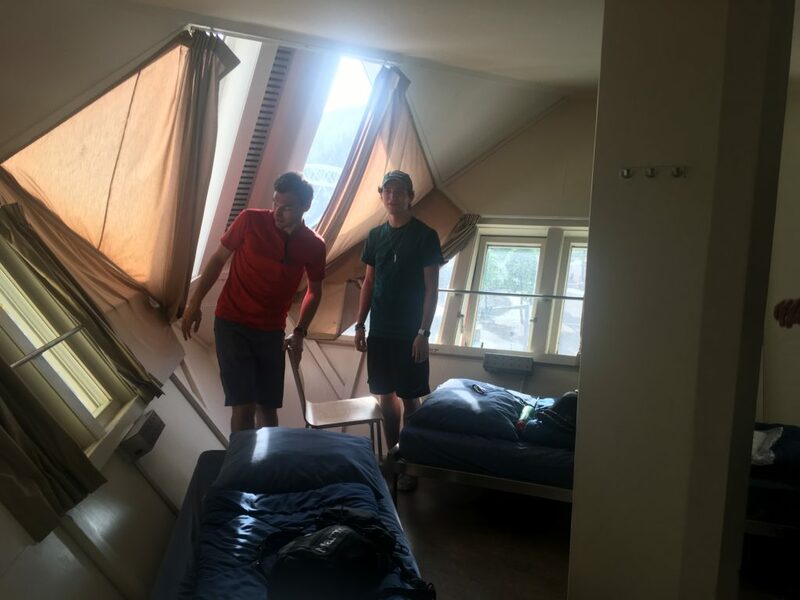 We soon found that the interior of the cubes had several disadvantages, including small windows that could not be opened and no AC. Regardless, spending the night in the cubes made for a very memorable experience in one of the most unique buildings I have ever seen. Not only were the rooms inside tilted cubes, but the entire structure was placed above a busy street! The next morning in Rotterdam was spent exploring the city in order to complete a scavenger hunt made by our awesome professor and TAs. After running around the city for two hours completing the challenges, our group of three claimed a narrow victory. The prize? A tasty dessert of our choosing courtesy of Kris, Carolyn, and Holden. Lekker! Onto the Hague for the next few days! Great post, Preston! I think all the rooms must have been quite different cause ours was HUGE and had an air conditioner! One of my favorites rooms on the trip, for sure!